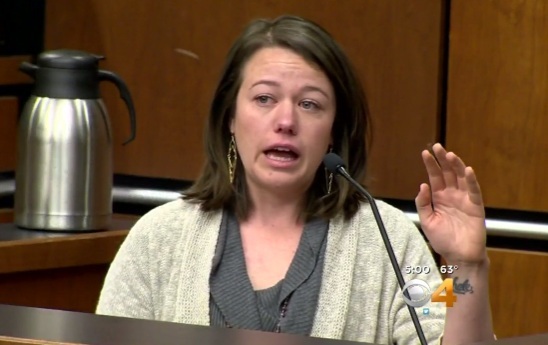 BOULDER, Colo. -- A woman whose baby was cut from her womb by someone she just met testified Wednesday that she told herself she had to survive for the sake of her unborn daughter and tried to fight back. Wilkins' child didn't survive -- something Wilkins learned the next day in the hospital. Lane was charged with attempted first-degree murder, assault and unlawful termination of a pregnancy. CBS Denver previously reported that Wilkins had recently moved to Colorado. She was teaching pottery classes at the time. The case revived debate over the legal rights of fetuses and brought calls for a murder charge, which prosecutors said they couldn't file because a coroner found no evidence the fetus lived outside the womb. Testimony in the trial began Wednesday and is expected to continue into next week. Wilkins testified she went to Lane's home in response to a Craigslist ad offering free maternity clothes. She was 7 1/2 months pregnant. "I just remember asking her why she was doing that," Wilkins said. She told Lane she loved her, hoping she would stop. Lane replied, " 'If you love me, you'll let me do this,' " and stabbed her in the neck with a piece of broken glass, Wilkins testified. Wilkins, now 27, spoke in a trembling voice but remained calm and composed. She appeared to be near tears twice -- when District Attorney Stan Garnett showed her photos of herself when she was pregnant and when she described learning her baby hadn't survived. Lane had no visible reaction and sat with her eyes cast downward. She was expressionless throughout the day's testimony, wearing a gray pantsuit and a blue button-down shirt. A deputy removed her handcuffs when she entered the courtroom. In opening statements, defense attorney Jennifer Beck said Lane didn't plan the "hasty, impulsive and reckless" attack and never intended to kill Wilkins, despite the bloody scene. Lane's friends even threw her a baby shower. But Ridley said he grew suspicious when Lane's due date kept changing and she refused to go with him to see a doctor. She had told him when they started dating that she had had tubal ligation and could not get pregnant, so he was happy when she announced in April 2014 that she was expecting a boy. At a hospital, she told doctors she had given birth at home but refused treatment crying "Save my baby!" An exam revealed no signs that she had been recently pregnant.